Moesif launched a free tool that can be used to monitor your 3rd party APIs. Many API providers have their own status dashboard such as status.dropbox.com or status.box.com. However, each is hosted at the individual company’s domain. Sometimes, you just want a centralized or global view of the operational status for all the services that you are dependent on, which is where this tool comes in. With the growth of APIs and SaaS, a company is able to outsource much of their non core product functionality to third parties. Everything from CI/CD to payment processing can be outsourced to third parties. However, companies are now dependent more than ever on these service’s reliability. For example, an e-commerce mobile app can be dependent on Braintree’s uptime or Recurly’s uptime for payments, Twilio’s uptime or Mailgun’s uptime for SMS and Email, and even CircleCI’s uptime for continuous integration. Because of these dependencies, it’s critical to know the status and availability of these services. While many of these companies host a status page for their customers, it’s not easy to unify that data into a centralized dashboard. This is why we created a free tool that can monitor multiple APIs and services in one single dashboard. 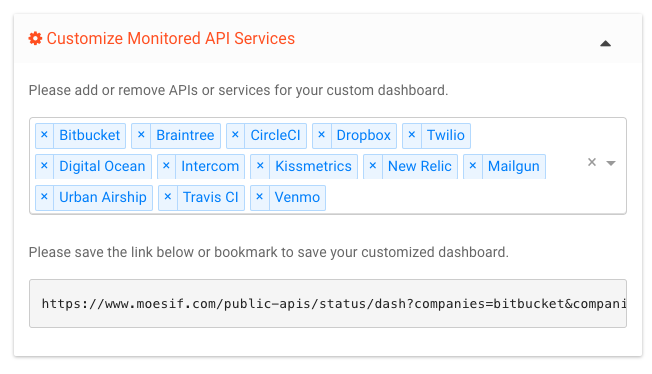 The main dashboard gives you a high level view of all the APIs and services that you chose for monitoring. Services and APIs are organized by five major status codes: operational, minor, major, critical, maintenance. 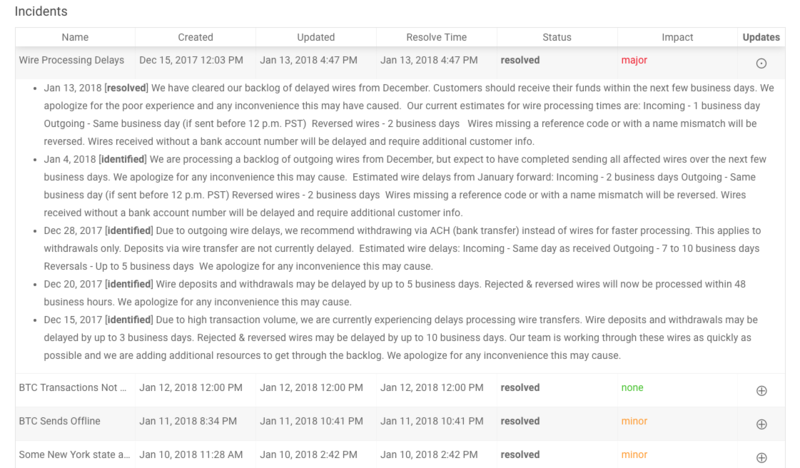 For each service, there is a status summary for the components of each service along with a highlight of unresolved incidents and any in-progress maintenance. You can choose which services you want to monitor using a dropdown multi select on the top right. Simply search or select the service you want to monitor. The URL can be bookmarked and shared. When you revisit the URL, the same services that you previously selected will be shown. Be sure to bookmark your customized dashboard or save the link and share with others. You click on an individual service to see more details. The details view will have a breakdown of status by each component along with a list of past incidents and maintenance events. There is also a section for upcoming scheduled maintenance. You can also sort and filter based on variety of data such as: status, impact, updated time, resolved time, and more. We do realize the current list of supported organizations is not complete. We will continue to add missing services or APIs that you’re using. To help us prioritize, please feel free to contact us to let us know which ones should be added.